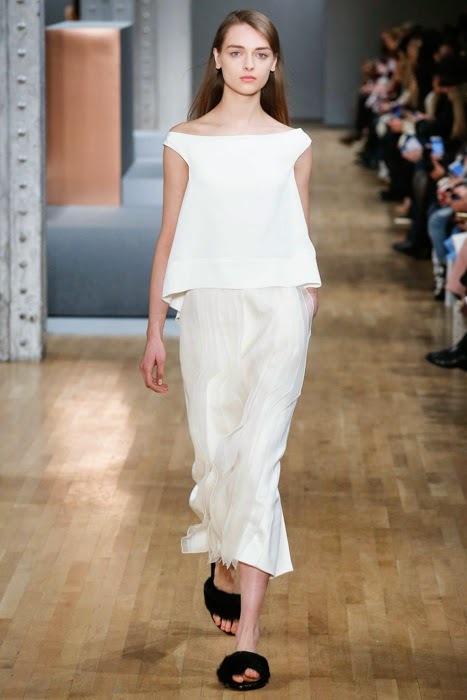 I love the minimalism of Tibi and calm colour pallet, going for a monochromatic look rather than high contrast. All of the fabrics look luxurious and east to wear. I'm especially a fan of the first picture, the neckline and structure of the top is a cool textural contrast to the light, flowing skirt that hits at the perfect length. The black, fluffy sandals are so much fun too! Taking inspiration from the 60s, there was a lot of minis and maxis, over the knee boots and stacked heel mary janes. I like the frayed hemlines that add an undone, effortlessness look to a clean, mod dress that makes it feel modern. My favourites out of this collection were the looks with leather patchwork like the coat in the first picture. I am always a fan of what the Olsen twins do for The Row, their clothes are simple with clean silhouettes and a focus on the highest quality fabrics, perfectly cut and an appeal for women of all ages. 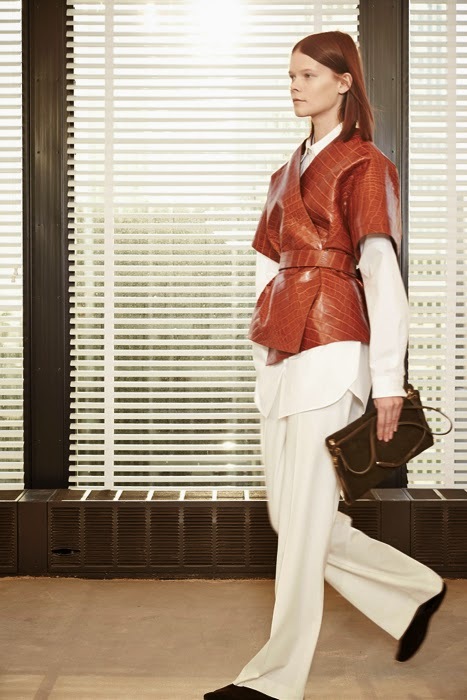 They defined the waist of some of the looks with kimono style thick belts that tie in the back. Olive green was the main hue throughout the entire collection, along with a soft grey and a few looks of bright red. This shade of green happens to be one of my favourites and I think it looks amazing paired with the same shade of fur, which seemed to be a popular way to add texture to many collections for fall. These were some of my favourite collections from New York Fashion Week Fall 2015, what were yours? So many great collections this year! Loving the culottes and wide leg pants!